in as little as 5 minutes a day! 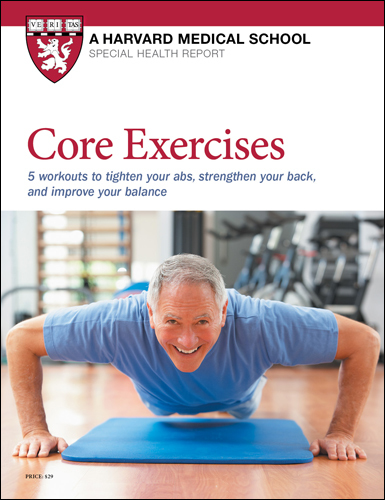 Strengthening your core is one of the best things you can do for your health as you age. Core exercises not only help to ease pain, they improve your balance and increase your flexibility, which can help you maintain your independence. Core Exercises brings you five complete workouts — each with seven exercises — that you can do on your own with little or no equipment. Each workout is specially designed to help make doing everyday tasks, and playing sports like tennis and golf easier. How Good is Your Balance? Try this test now. Start by standing comfortably near the wall, holding your arms in any position you choose. Lift one foot an inch or two off the floor so that you are balancing on the other foot. Time how long you can do this before having to put the raised foot down or touch the wall for support. If you can’t stand on one leg unassisted, lightly touch the wall or hold the back of a chair with one or both hands for support. Use less support as you improve your balance. If you can hold this single leg stance for 60 seconds or more, you have excellent balance. If you can’t hold it for more than 10 seconds, you could be at risk for a fall. If so, get a copy of Core Exercises and ask your doctor for more ways you can improve your balance and prevent falls. Special Bonus Section at no extra cost! Plus get a Special Bonus Section at no extra cost to help keep you motivated to exercise and more!